(P1) Keep the oil taps flowing for the good of the people, the CEO and chair of ExxonMobil appealed to shareholders at what the Guardian says was a “long and fractious” annual meeting in Dallas on Wednesday. 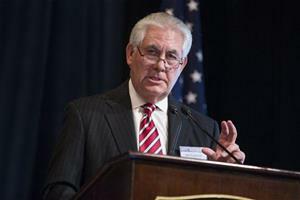 Rex Tillerson told attendees the oil giant had already pumped $7 billion into green initiatives, but that technology hasn’t yet reached a point where the company can move away from fossil fuels. “Until we have those technology breakthroughs, just saying ‘turn the taps off’ is not acceptable to humanity,” he said. “The world is going to have to continue using fossil fuels, whether they like it or not.” Tillerson rejected proposals during the meeting that would bring ExxonMobil more on board with addressing climate change, noting the company anticipates oil and gas will still fuel about 60% of the world’s energy needs in 2040. He also said there’s “no scientific basis” for keeping global warming at 2 degrees Celsius or less, per the international climate change accord reached in Paris in December, the Washington Post notes. (P2) At least some of the shareholders agreed, with the Post reporting a “choked up” attendee telling Tillerson, “You personify all that is best in America. The lives of all of us shareholders are more secure and, in return, happier because of you.” A vocal activist minority, however, had a different take on how the company should be approaching environmental concerns, with 38% voting “aye” to a proposal that would force ExxonMobil to annually document how adhering to climate change rules would affect profits. Critics have called out ExxonMobil for claiming concern about the environmental effects of fossil fuel while simultaneously funneling money to groups that downplay those effects, per the Post. While the shareholders’ proposals were rejected, the Guardian notes that the significant-enough numbers shown in the vote may make it easier for them to get rid of the board’s old guard and suggest members more friendly to renewable energy. The ExxonMobil CEO said, “The world needs our oil, like it or not”. Do you agree with him? Why or why not? Tell me some renewable energy resources. Should more renewable energy be used? Why or why not? Is it important for energy companies to invest in renewable energy? Why or why not? Does your country use renewable energy? If yes, explain. If no, should they start?